Last week I completed the final chapter draft for my thesis. Words cannot describe how incredible a feeling it is to know that the bulk of the work is done. But now comes the most important job, redrafting my chapters into a cohesive whole. 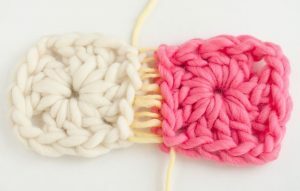 This process reminds me of crochet (my favourite hobby) when the individual squares for a blanket are complete and they now need to be stitched together to make a whole. The creation of the individual squares is important but it is how they are brought together that makes a great blanket. This is also true of thesis chapters. As I began the initial drafting with my literature review last year, there are important themes that arose later in my work that I now need to bring to the fore, concepts that were touched upon but now hold greater significance. To help with this process, I decided that it would be beneficial to reflect on what the core themes are from the findings and discussion. In this way, I would highlight for myself the themes that need to be strengthened throughout the remainder of the thesis. The impact of teacher workload on teacher’s professional development. This is a topical issue, given the heightening concern for teacher workloads in the UK. The loss of central support for ICT/digital pedagogy. With the burning of the QUANGOs at the beginning of the coalition government, central support organisations, such as BECTA, were removed. Nothing has been implemented to replace these resources, meaning that no nation-wide support system is in place. Abundance of information paired with lack of awareness of where best to find advice, guidance and resources. This is exacerbated by the previous point. If a national organisation were to be in place to support digital pedagogy, practitioners would be clearer on where to locate information and resources. Overreliance on generic and functional skills ICT training. Teaching staff how to work the functional elements of an iPad (camera, etc.) does not support it’s pedagogic use in the classroom. Perceived heavy initial investment required to engage with digital practices. There is the time needed to learn how a device or software works, time to consider its application to teaching and learning needs, time to teach students how to use the device or software (where necessary) and time to reflect on the success of a new approach and devise ways to improve its use. Impact of school funding cuts on support roles. Many of the schools only had access to part-time technicians, which restricted the times during which some teachers felt comfortable experimenting with new practices. The role of internal, informal professional development. Much of the digital literacy development discussed by the teachers within my study was ad hoc. They had an idea and turned to a colleague for advice and support. There is currently little in the way of research around the value of internal and informal CPD, though it has clearly played an important role in this context.